How do advances in brain imaging technology affect neurobiological theories of psychology? Only a few decades ago, it was not possible to observe the human brain in action. Autopsies after death and neuropsychological studies of brain-injured patients were the main methods of neurobiological research. With the advent of brain imaging technology, however, it became possible to obtain snapshots of the living human brain. 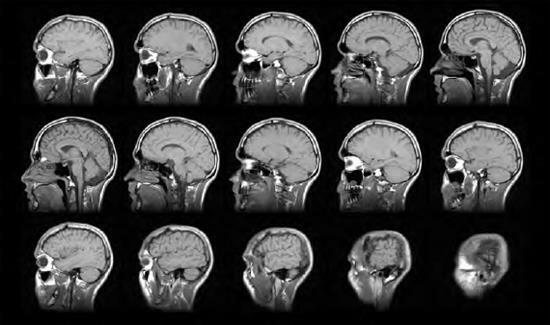 Computerized tomography (CT scans) and magnetic resonance imagery (MRI) allowed pictures of brain anatomy. Positron emission tomography (PET) and single photon emission computed tomography (SPECT) scans allowed investigation of the actual workings of the brain via recorded patterns of glucose uptake or blood flow. More recently, functional MRI (fMRI) allows rapidly repeated images of brain activity, permitting study of brain activity over time. In effect, brain imaging technology has moved from still photos to moving pictures. Moreover, subjects can be scanned while performing various actions, opening up an enormous array of research possibilities that will take many years to fully exploit. This photograph shows a Magnetic Resonance Imaging (MRI) brain scan for a 22-year-old man. The scan includes twenty vertical slices starting from the man’s right ear and running through to his left ear. Brain imaging technology allows us to view the workings of a living brain, an extraordinary accomplishment possible only in the last few decades (iStock).